PLAYING WITH SUGAR: Let them eat cake - Red, White and Blue Jello Cake. 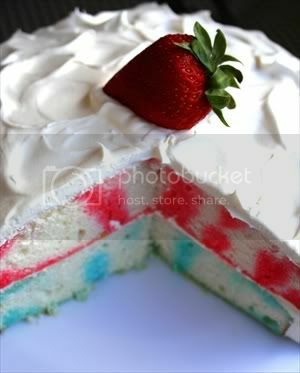 Let them eat cake - Red, White and Blue Jello Cake. While Will and I were watching TV the other day, CNN had a story about a study done in Canada that states that a few extra pounds can add years to your life!!! You can read the full Reuters article here. Well, you can imagine my delight being that I am a baker and have an insatiable sweet tooth!!! I think I jumped off of the sofa, clicked my heels together and did a few cartwheels for good measure! Okay, I am exaggerating a little, but trust me when I say I was more than a little thrilled. I did sit there and exclaim to Will (who I think was born lacking any type of sweet tooth) - LET THEM EAT CAKE!!!! So that my fellow American's is just what I am going to do!!! I am presenting to you the classic Jell-O cake in red, white and blue!! *NOTE* I am slightly upset that I did not add more Jell-O, but the kids were insisting that I save a little on the side for them (can you believe at 4 and 2 years old they have never tasted Jell-O? I wish I would have taken a video of the reaction to the first few bites - it was pee your pants funny to say the least!) Anyway, next time I will add more of the mixture to the cake. Prepare cake mix according to directions - I used two 9 inch round cake pans. Poke cakes with fork all over the entire surface of the cake. - Usually half inch intervals. Making sure you poke all of the way through to the bottom. Prepare Jell-O according to directions on the box, with the exception of allowing it to set. Pour Jell-O slowly and evenly over the entire surface of cake layers - obviously I made 2 types of Jell-O and poured blueberry over one and strawberry over the other. I only used a cup of the Jell-O liquid but next time would use slightly more. Don't panic if the cake looks soggy, I promise it will be okay. Refrigerate cakes and allow Jell-O to set for at least 3 hours. To remove from pan, carefully sit cake pan in a small amount of hot water for 30 sec - 1 min. Unmold onto a serving plate. Top the bottom cake layer with Cool Whip, repeat with second (top layer) cake. Frost the top and side of the entire cake with the remaining Cool Whip. Garnish with fruit pieces (optional) - I used Strawberries and blueberries. Refrigerate for at least 1 hour or until ready to serve. Left over cake should remain refrigerated. Such a cool cake! What a creative idea! Love it! hhmm..jello cake rocks! Im going to be making that myself soon. The jello here in the netherlands is just so odd compaired to the american kind. I dont like eating it but imagine it will work just fine here. I kinda like it all dotted up like that! I haven't taken my ice cream maker off my counter since I got it! I love it. Course, I've been eating too much of that stuff, too! Happy Creaming! And happy 4th! Thanks for all of the wonderful comments! I heart you guys! Hope you had a wonderful holiday!